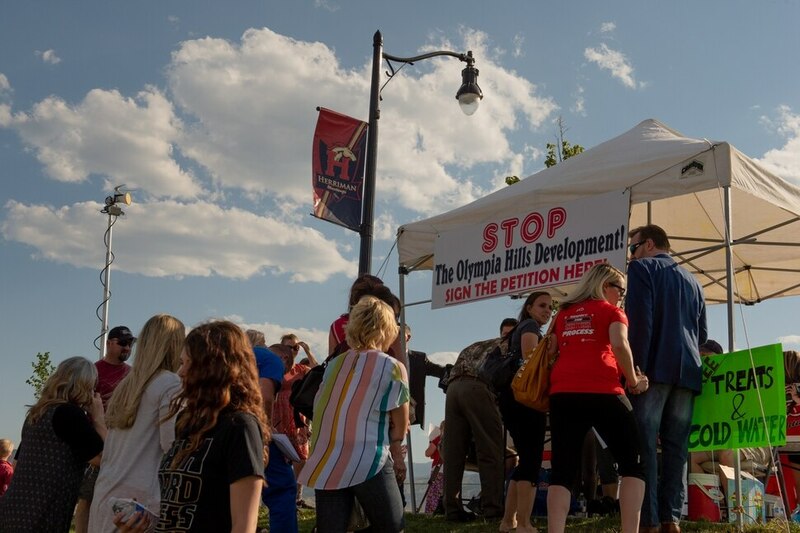 (Rachel Molenda | The Salt Lake Tribune) People sign petitions against the Olympia Hills Project, a proposed 8,800-home development project in the southwest part of the county, on Thursday, June 14, 2018. Salt Lake County Mayor Ben McAdmas held a public meeting to hear concerns from residents about the development. 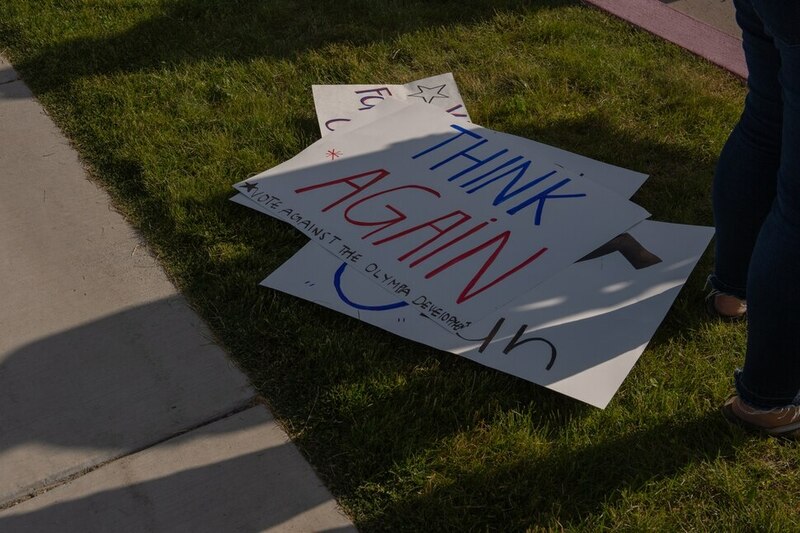 (Rachel Molenda | The Salt Lake Tribune) Residents protest outside Herriman High School on Thursday, June 14, 2018. Salt Lake County Mayor Ben McAdmas held a public meeting to hear concerns from residents about the Olympia Hills Project, a proposed 8,800-home development project in the southwest part of the county. 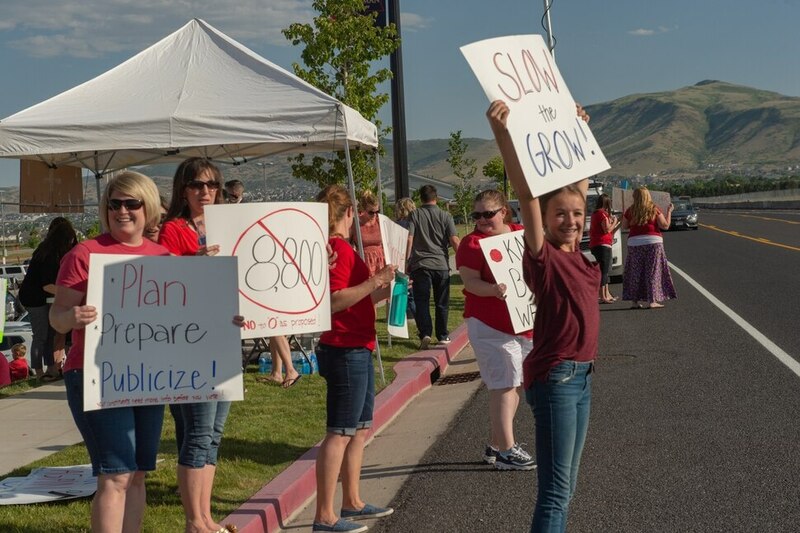 (Rachel Molenda | The Salt Lake Tribune) Residents protest outside Herriman High School on Thursday, June 14, 2018. Salt Lake County Mayor Ben McAdmas held a public meeting to hear concerns from residents about the Olympia Hills Project, a proposed 8,800-home development project in the southwest part of the county. (Rachel Molenda | The Salt Lake Tribune) Residents speak against the Olympia Hills Project, a proposed 8,800-home development project in the southwest part of the county. Salt Lake County Mayor Ben McAdams held a public meeting at Herriman High School on Thursday, June 14, 2108, to hear concerns from residents (Rachel Molenda | The Salt Lake Tribune) Salt Lake County Mayor Ben McAdams held a public meeting at Herriman High School on Thursday, June 14, 2108, to hear concerns from residents about the Olympia Hills Project, a proposed 8,800-home development project in the southwest part of the county. (Rachel Molenda | The Salt Lake Tribune) Richard James, Herriman, speaks against the Olympia Hills Project, a proposed 8,800-home development project in the southwest part of the county. Salt Lake County Mayor Ben McAdams held a public meeting at Herriman High School on Thursday, June 14, 2108, to hear concerns from residents (Rachel Molenda | The Salt Lake Tribune) Emily Johnson, of Herriman, speaks against the Olympia Hills Project, a proposed 8,800-home development project in the southwest part of the county. Salt Lake County Mayor Ben McAdams held a public meeting at Herriman High School on Thursday, June 14, 2108, to hear concerns from residents (Rachel Molenda | The Salt Lake Tribune) Salt Lake County Mayor Ben McAdams, County Councilman Jim Bradley, Herriman Mayor David Watts, Salt Lake County Councilwoman Ann Granato and Salt Lake County Councilman Max Burdick listen as residents speak against the Olympia Hills Project, a proposed 8,800-home development project in the southwest part of the county. McAdams held a public meeting at Herriman High School on Thursday, June 14, 2108, to hear concerns from residents (Rachel Molenda | The Salt Lake Tribune) Salt Lake County Mayor Mayor Ben McAdams listens to Herriman area residents' concerns about he Olympia Hills Project, a proposed 8,800-home development project in the southwest part of the county. McAdams held a public meeting at Herriman High School on Thursday, June 14, 2108. (Rachel Molenda | The Salt Lake Tribune) Herriman resident Melissa John said she doesn't oppose high density generally, but thinks the speak against the Olympia Hills Project, a proposed 8,800-home development project in the southwest part of the county, goes too far. Salt Lake County Mayor Ben McAdams held a public meeting at Herriman High School on Thursday, June 14, 2108, to hear concerns from residents (Rachel Molenda | The Salt Lake Tribune) Residents give a standing ovation to one person's concerns about the Olympia Hills Project, a proposed 8,800-home development project in the southwest part of the county. Salt Lake County Mayor Ben McAdams held a public meeting at Herriman High School on Thursday, June 14, 2108, to hear concerns from residents (Rachel Molenda | The Salt Lake Tribune) Residents listen as members of the public speak against the Olympia Hills Project, a proposed 8,800-home development project in the southwest part of the county. Salt Lake County Mayor Ben McAdams held a public meeting at Herriman High School on Thursday, June 14, 2108, to hear concerns from residents (Rachel Molenda | The Salt Lake Tribune) Jeff Winegar, Herriman, speaks against the Olympia Hills Project, a proposed 8,800-home development project in the southwest part of the county. Salt Lake County Mayor Ben McAdams held a public meeting at Herriman High School on Thursday, June 14, 2108, to hear concerns from residents (Rachel Molenda | The Salt Lake Tribune) Sonia Salari speaks against the Olympia Hills Project, a proposed 8,800-home development project in the southwest part of the county. Mayor Ben McAdams held a public meeting at Herriman High School on Thursday, June 14, 2108, to hear concerns from residents (Rachel Molenda | The Salt Lake Tribune) Residents esidents listen as members of the public speak against the Olympia Hills Project, a proposed 8,800-home development project in the southwest part of the county. Salt Lake County Mayor Ben McAdams held a public meeting at Herriman High School on Thursday, June 14, 2108, to hear concerns from residents. Herriman • High-density housing rarely is a top issue in a congressional race. But Democrat Ben McAdams faced a loud crowd of 400 people Thursday griping about that growing controversy in his tight 4th District race against incumbent Rep. Mia Love. McAdams, the Salt Lake County mayor, used a town hall meeting at Herriman High School to listen to concerns from residents to the proposed Olympia Hills project — a community billed as similar to Daybreak but with triple the density, with 33,000 people on 938 acres in an unincorporated area west of Herriman. Meanwhile, Love has attacked McAdams for taking $10,000 in donations from project developers “right about the time he was negotiating the deal” and said he “refused to listen to the mayors and residents’ concerns” initially only to play power broker to solve concerns after the County Council approved zoning for it. Dozens of residents of cities near the proposed development paraded to microphones Thursday to ask McAdams to veto the project — and sought a reversal by the County Council. Many gathered signatures outside for a referendum petition to overturn the approval if necessary. McAdams told them, “I always make better policy decisions after I listen to different points of view. That is why I am here tonight,” insisting he was not there as a congressional candidate but as a concerned county mayor. He said he is weighing whether to revise the current plan to make it more acceptable or require it to start over. The crowd cheered loudly only when he suggested starting over. He added, “The proposal as it stands now needs to change,” followed again by loud applause. “I believe the plan in front of us is too dense” and doesn’t have plans to adequately provide needed streets, transit, schools and water. The crowd also cheered that. McAdams said he will make a decision in a few days. “We all want to get this right,” he said about the project that as now proposed would be among the most densely populated areas in the county, with 4,738 apartments, 2,485 town houses and 1,497 single-family homes — plus retail space and a 100-acre Utah State University satellite campus. It would have about 37 residents per acre. 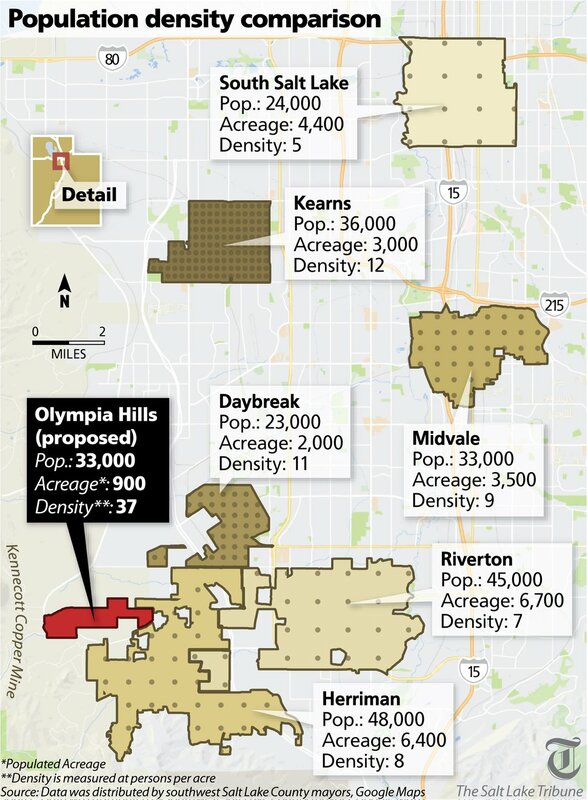 In comparison, Herriman has 8 per acre, Riverton has 7, and Daybreak in South Jordan has 11. Residents talking at the town hall universally condemned the project and called for it to start over. Richard James, who has lived in Herriman for nearly 50 years, said, “When I first moved to Herriman, we had one road in here. 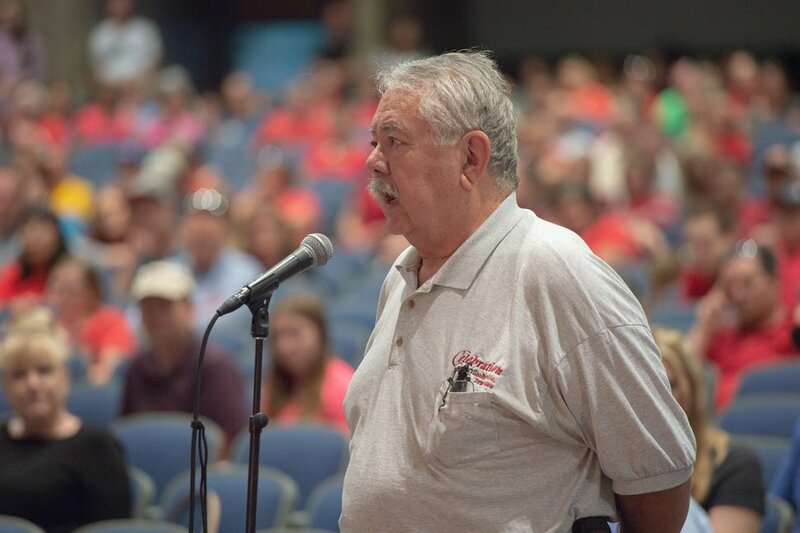 We don’t have much more than that now.” He added that clogged highways cannot handle another large project whose residents would need to travel through Herriman to get to freeways.